MithraREM is the reference software to know, understand and communicate with citizens on exposure to electromagnetic fields. MithraREM is simulates at city scale electromagnetic, fields of antennas (mobile, telephony, radio, TV…) and gives dynamic visualization of these results. 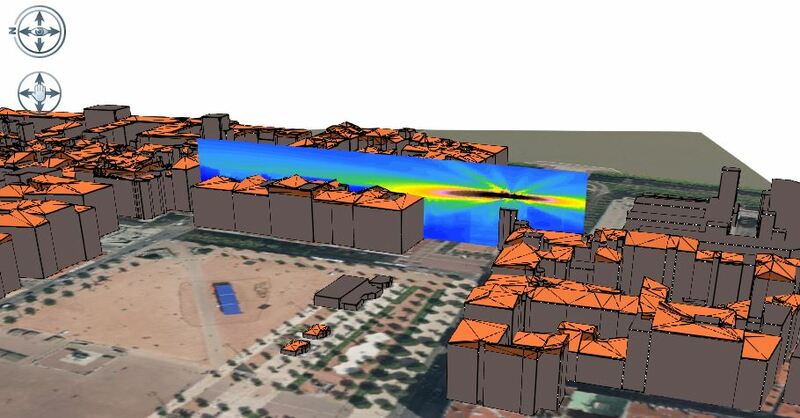 MithraREM is the result of the collaboration between two specialists, the CSTB (Scientific and Technical Center for Building) and Geomod, who have combined their respective expertise to develop a powerful electromagnetic field exposure simulation software. The CSTB, renowned French expert with over 30 years of research into Electromagnetic, provides state of the art simulation engines in terms of both precision and performance. Geomod, expert in geomatics and renowned for its high reactivity and the quality of its support, brings its expertise in development and integration. Modification of an existing site: new technology, news antennas power, electric tilt, modification etc. Convert your data in multiple formats from simple 2D model with extruded buildings to full 3D model with roofs. Create automatically and quickly your project from SRTM and OpenStreetMap. MithraREM is based on a GIS: Cadcorp SIS. 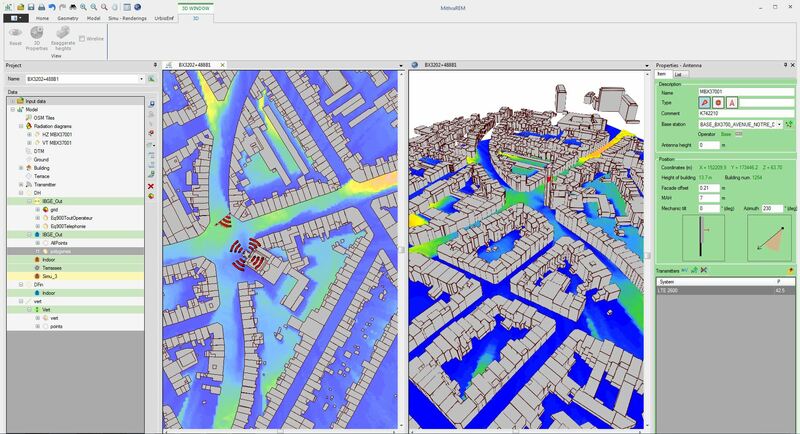 The Geographical Information System (GIS) brings accessibility and interoperability through advanced design, editing, analysis and rendering features. A wide range of more than 160 formats are supported in both reading and writing, including SHP, MIF/MID, TAB, DXF, DWG, DGN, etc. MithraREM is the most accurate and efficient software dedicated to exposure of electromagnetic fields. MithraREM uses powerful algorithms based on an adaptive beam propagation. A geometric motor determines all the 3D contributions of the antennas and a physical motor calculates these contributions for each frequency band and each antenna, taking into account the materials encountered. Indoor methods estimate the field inside buildings, taking into account the attenuations as a function of the angle of incidence and materials. Outdoor methods estimate the field outdoors (balconies, terraces, etc) and on the ground. MithraREM is adapted to the legislation of countries. It allows to create maps according to the limits of the international regulation (ICNIRP), the ANFR guidelines (France) and the Belgian ordinances of the Brussels region. 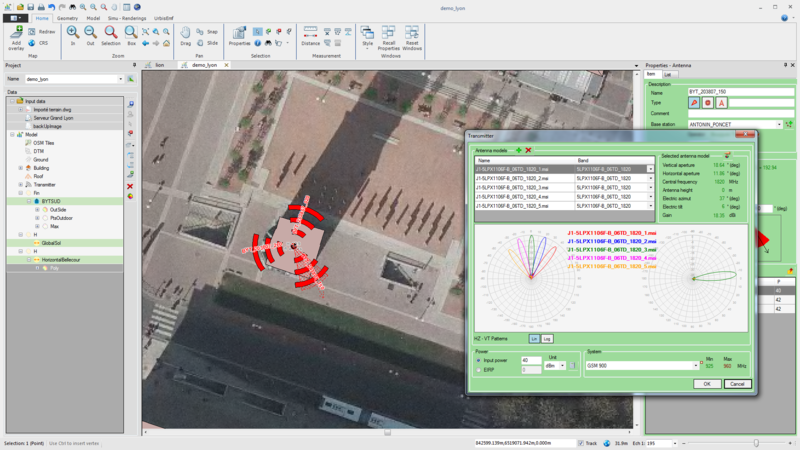 MithraREM can handle different type of projects, including simulation on a defined area close to a single antenna or current situation at city scale. Updating results depending on a modification of the network is facilitated, no in-situ measurement is necessary. MithraREM imports the new antennas and restarts the simulations. MithraREM can estimate several units like electric field V / m (or V / m equivalent 900), magnetic field A / m and intensity of electromagnetic radiation W / m², percentage according ICNIRP guidelines, etc. MithraREM has dynamic renderings. Simple checkboxes allow you to define all the parameters of a map: units, antennas, frequencies, color table, rendering type, precision. The map is updated in real-time when these parameters are changed. The contribution analysis tool gives the details of field contributions in different categories: per antenna, per operator, per frequency and per technology. MithraREM can measure the impact of exposition in terms of populations. MithraREM 2D and 3D maps are great communication vectors. They provide an objective advice in public meetings related to network deployment. The very powerful and intuitive reporting tool helps to format maps before publishing them.